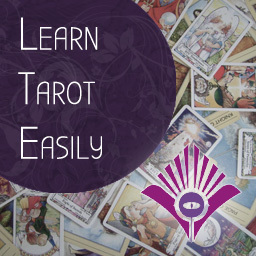 Tarot is a lyrical language of the soul’s encounter with the Universe. It arises freely, and like the most dignified dance, allows us to express ourselves in motion to the music of the divine. The re-arrangement and reading of the deck is as sacred as the most religious ritual or act of love. Remember then, from the very beginning, to Treasure it. Trust it. Let it divine you. 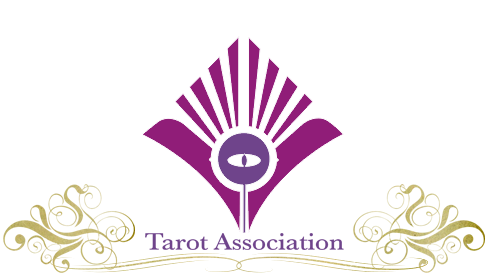 The tarot deck itself is a sacred artefact. It is a place-holder for our encounter with what we do not yet know in life. As such, when we lay it out in a fixed spread, we constrain it within our own choice and expectation. We assume that we know which spread will be suitable to our situation. Having said that, the oracular moment is sacrosanct, so it likely matters not at all whether you choose a spread. In Tarosophy we seek to follow our cards with one essential attitude; curiosity. This means that sometimes, we will simply read the cards in some manner that does not involve any fixed spread or positions. 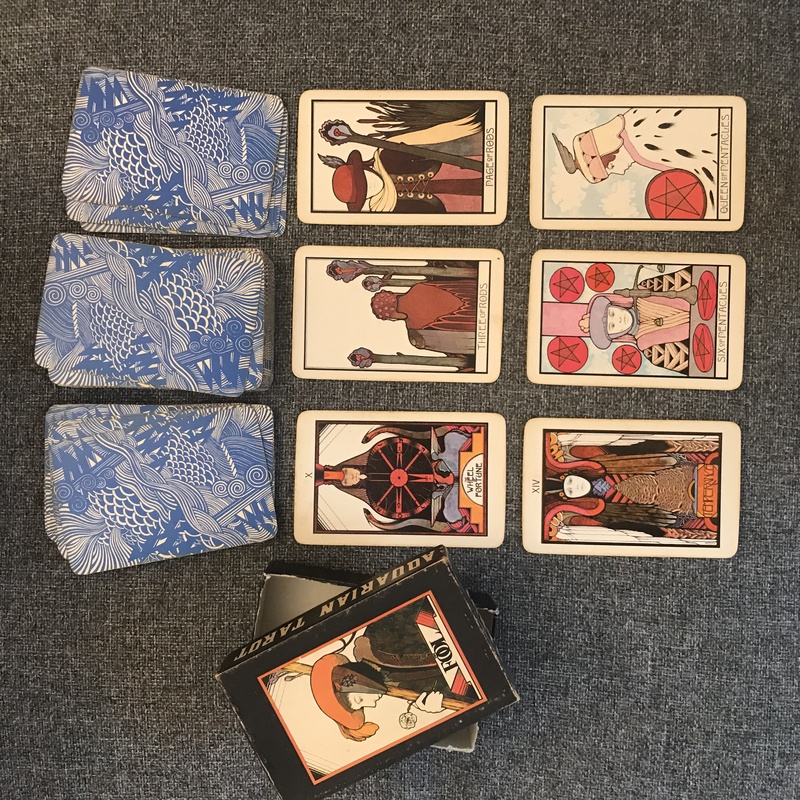 In this lesson we will work with one of the many Tarosophy split-deck methods, which goes beyond basic spreads but is easy to perform as a beginner. 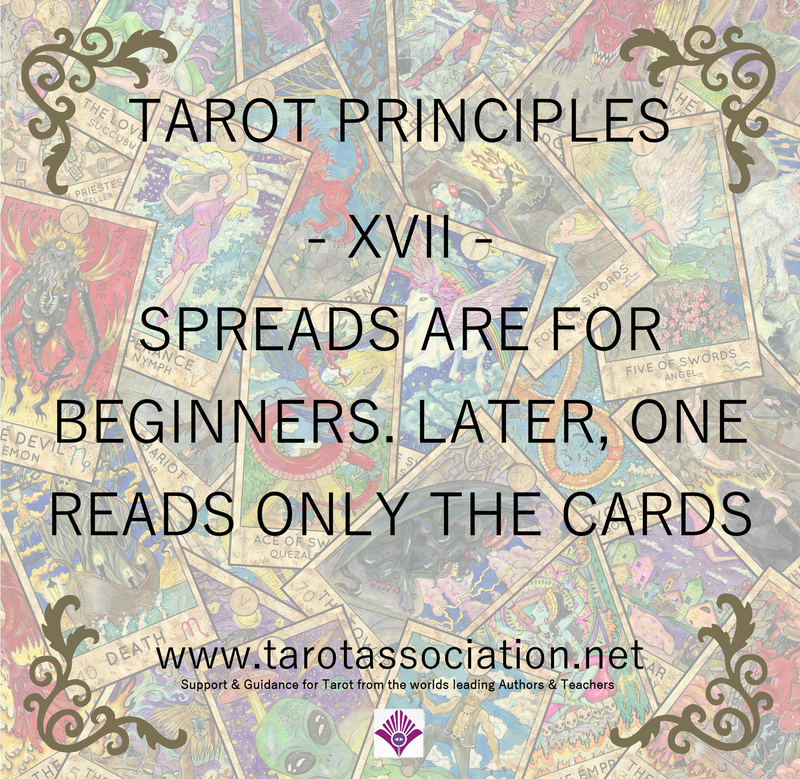 We call it “Oracular Sentences” and is good for practice, self-reading, and particularly parties – it is one of the methods for practical readings we cover in Tarot Face to Face. 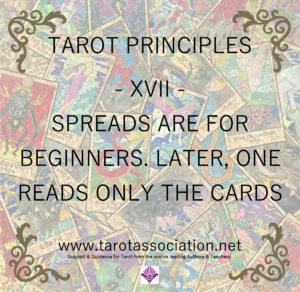 Divide your deck in advance into three piles; Majors (22), Minors (56) and Court cards (16). Place these three separate piles face-down from left to right on your chair, table or other space available. These three piles will form the structure of an “oracular sentence” composed of a noun (object), a verb (action) and an adjective (a description). You may wish to practice this method and then play with your own variations. Pause and then select the top card from the first pile of Majors. 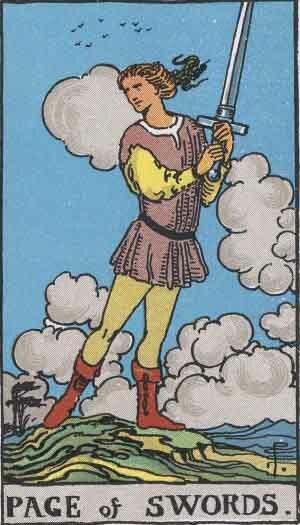 Turn it upwards and say, in your most oracular voice the name of the card. 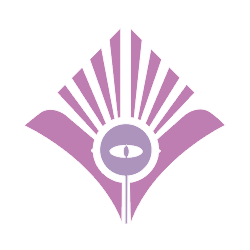 If for example, you turn over the “Empress”, simply say “The Empress”. If you are moved in the moment to say something else, do so – however try and ensure it is a noun, an object, or a thing that you can see on the card, for example, “The Field”, or “The Waterfall”. Never deny an oracular moment, always say what tells true to you. Now select a card from the second pile of Minor cards. 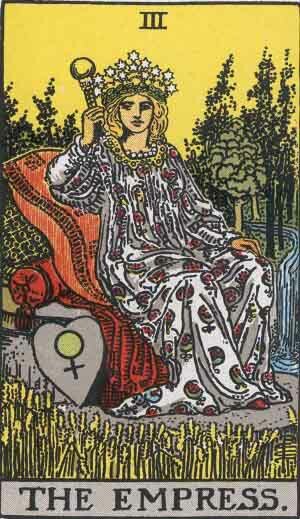 This card is the ‘verb’ of our Oracular Utterance. This card says what the previous noun or object is doing. 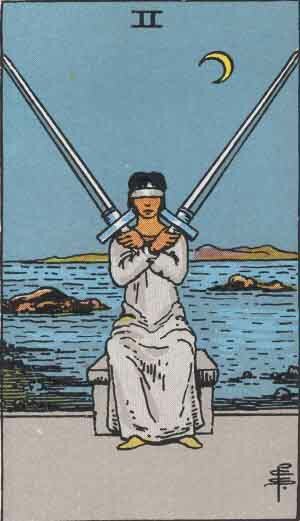 As an example, if we pulled the 2 of Swords, we might say “balances” or “weighs up” or even “waits”. Finally select the top card from the third pile of Court Cards. 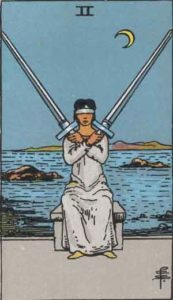 This gives you the adjective or descriptive word for how the verb (action) is being performed, for example, if you pulled the Page of Swords, you might describe this as “carefully”, “cleverly”, “thoughtfully” or “cautiously”. 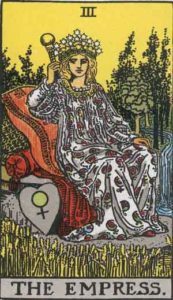 “The Empress Weighs up Carefully … so be aware that whatever you sow you shall reap”. And that is it. Do not interpret or explain your oracle, even to yourself. “The Field Waits Cautiously. That is your oracle. Remember, this is important – The Field WAITS cautiously”. 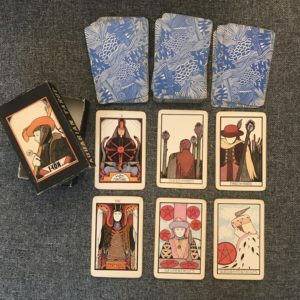 It is meant to be mysterious and enigmatic – but nonetheless, it may be very powerful (in Tarot Face to Face we share one of many events where this method totally hit home with someone and shocked them into insight). Make sure you speak in an over-the-top or simply deliberate oracular voice, even if you are doing this method for yourself. 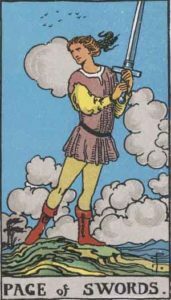 As an advanced version of this method, when you have practiced your oracular sentences arising from three cards, you can perform this reading by taking the top cards as already described, then adding a “BUT …” and taking the bottom card from each of the three piles and adding that sentence as a prophetic warning or advice. 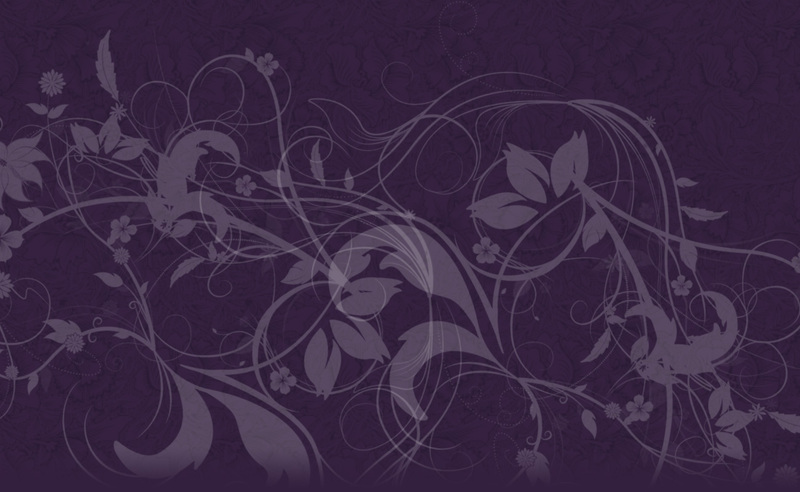 “Your Centre may look out earnestly … but your Angel measures you materially”.